Time Zone: Select your time zone and if daylight savings is active. Time Mode: The NTP Server allows the RPS-NODE-9258 WiFi to check with a NTP (Network Time Protocol) to constantly keep the internal clock of the device updated. Update Time Server: Click the update button to automatically adjust the time of the device. You can also manually set the time of the remote power switch. Restart: Restart the RPS-NODE-9258-WiFi unit. Restore: Resets all parameters, except the IP parameters to the original factory settings. Default: Resets all parameters to the original factory settings. 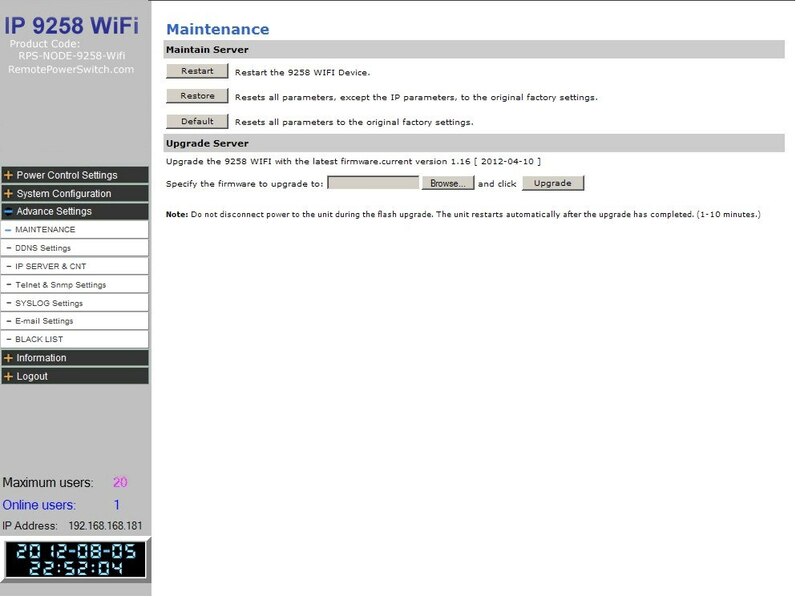 Upgrade Server: Here you can update the firmware for the RPS-NODE-9258-WiFi. 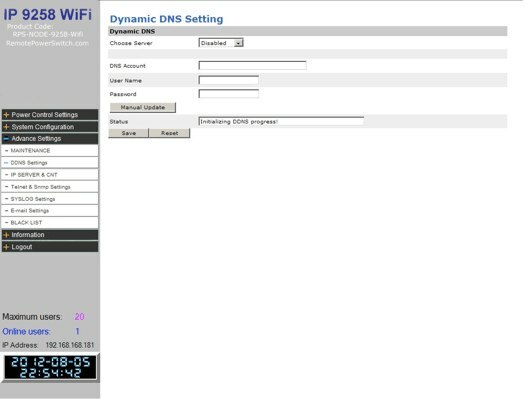 This sections allows you to use the DynDNS ( www.dyndns.com ) service to allow you to access your RPS-NODE-9258-WiFi . Using the DynDNS service allows you to have a subdomain (Example: myRPS.dyndns.com ) that points to the remote power switch which has a regularly changing IP address. These selections are not active. Look for updates to this section.